At 2 Feet Brewing on Columbia Street in Bangor, it would not be a stretch to see a patron at the brewery enjoying a cold, craft beer with a toasty hot pretzel both made from the same batch of grains. Moreover, that pretzel could well be served with a cheese dip made from the very beer that had just been poured. That’s because 2 Feet is helping to ensure the spent grain from their brewery doesn’t go to waste. Spent grain is a byproduct of the beer making process. It takes a lot of grain to produce beers, but once the brewing is done all that grain is leftover. It could go into the trash but brewers like Cory Ricker at 2 Feet are ensuring it gets used. 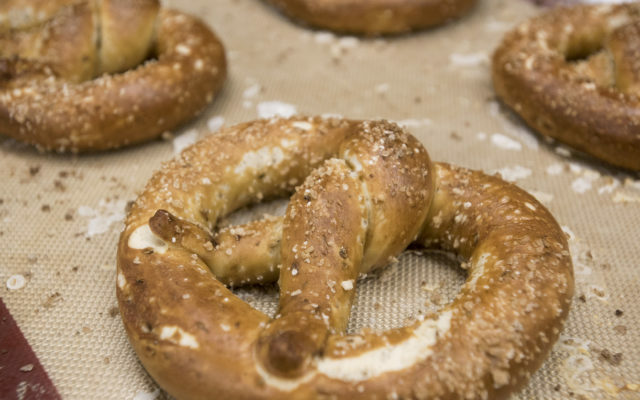 Shortly after 2 Feet opened in 2016, the brewery entered an agreement with Fork & Spoon on Main Street in Bangor, a bakery and eatery, to have that grain used to make pretzels. Fork & Spoon also uses grain from 2 Feet to make pretzels for Nocturnem Draft Haus on Main Street in Bangor and Mason’s Brewing Company on Hardy Street in Brewer, as well as their own croissants. But the eatery can’t use all the spent grain from 2 Feet, so the brewery has found other ways to give the grain new life. In fact, there was a demand for 2 Feet’s spent grain almost as soon as the nano-brewery poured its first glass. That farmer takes most of the 100 pounds of spent grain left every week from 2 Feet’s brewing operations, but there are several pounds — about a bucket’s worth — that go to Fork & Spoon. At Mason’s in Brewer, owner Chris Morley estimates his brewing process results in about 2,000 pounds or more of spent grains every week, and he’s more than happy to see them go to anyone who wants them. Ricker was approached by the folks at Fork & Spoon who had been encouraged to try working with spent grains by the owner of Nocturnem, who wanted locally produced spent grain pretzels for his bar menu. Fork & Spoon baker Lee-Russel Dunn had never worked with spent grain before, but began to experiment. “For the pretzel, it wasn’t very challenging because the dough is very elastic anyway,” Dunn said. Croissants were a little harder though since spent grain is typically wet and can make the dough soggy. Croissant dough, though, needs to be dryer. Dunn found a way to make it work. “It’s a little softer than a normal croissant dough, but it’s worked out really great,” Dunn said. The whole grains are added to the dough. “I just put it in directly and I adjust the moisture accordingly,” Dunn said. The efforts have paid off. The spent grain croissants may be even more popular than the traditional ones Fork & Spoon sells, Fork & Spoon owner Elisabeth Dean said. “I think most people are intrigued that it is a spent grain croissant,” Dunn said. But Dunn would love to do more with the spent grains, including grinding them into a flour — but that would take some processing that the eatery isn’t yet ready to do. “Ideally what I would love to do is to have a dehydrator to dry the grain out,” Dunn said. The grains leftover from brewing can have a rich life. Ricker said spent grain gives the pretzels a unique taste. For Dean, part of the allure of the spent grain is the variations it has on the end product. “You don’t always get that exact same thing every time,” Dean said. And that’s a plus, to her, since the nuances of flavor between the grains add different things to the doughs. She also appreciates how using the spent grains means that less is going to waste. Working with the spent grain does take some know-how — not just to adjust to using the wet grain but also to ensure that the grains don’t spoil before they can be used. Spent grain tends to be more perishable than other grains because of its moisture level. “When it’s not used within a two-week period, you start to see mold,” Dunn said. So Fork & Spoon started freezing the grains as they come in. At the brewery restaurant Morley said his kitchen staff is always on the lookout for more ways to incorporate the spent grains into the menu. They cook with them mostly for special occasion or ticketed events. Masons’ spent grains were featured at the end of February at a special dinner at the request of chef Emil Rivera from James Beard award winning restaurant Sur-Lie in Portland. Reducing waste by using the spent grains instead of simply disposing of them is all part of Morley’s commitment to giving back to the community. As for those pigs in Orrington, what goes around comes around.